In food processor, place all ingredients. Cover; process until a ball forms, stopping occasionally to scrape down sides of bowl with spatula. Line loaf pan with foil. Empty food processor bowl into loaf pan, pressing down mixture with spatula. 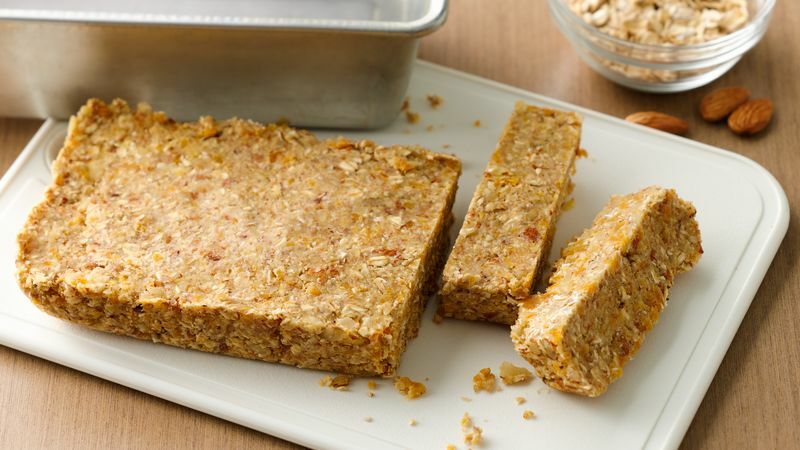 Refrigerate at least 30 minutes to firm up; slice into bars, and serve. Can also be covered and refrigerated overnight. These bars refrigerate well, covered, for 2 to 3 days. We love blueberry! Combine Yoplait® Greek blueberry yogurt, almonds, oats and dried blueberries for a delicious treat. The ingredients used in the photo are vanilla yogurt with dried apricots, but feel free to mix and match yogurt flavors and dried fruits to find your favorite!